The word TAKE is such a strong word. 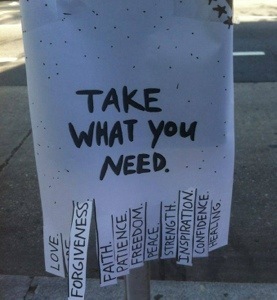 I love the idea of “take what you need” and we all need something different at any given time in our lives. I couldn’t help but wonder about just “Taking” what I needed without taking something for someone else. So here’s some Love, Peace, and Inspiration from me to you… Feel free to take more and share as much as you would like!